Following Hitler’s Directive No 33, Army Group Centre planned to send its mobile offensive forces northwards and southwards in early August. Having shattered the 28th Army around Roslavl, the 2nd Panzer Group’s 24th Panzer Corps was already in a good position to advance eastwards or southwards by 8th August. In conjunction with the German 2nd Army attacking towards Gomel, the 24th Panzer Corps started advancing south-west towards Starodub. Army Group Centre’s objective was the destruction of the 21st Army (in the Central Front which was formed on 24th July), and in so doing effect a junction with Army Group South to destroy the Southwestern Front. The Stavka were still generally unheeding of this danger as they believed the main German offensive would be directed towards Moscow. Accordingly they continued to deploy the large majority of newly mobilised and newly arriving forces along the Moscow-Smolensk axis, whilst supplying Central Front with only limited resources and ordering Southwestern Front to dig in around Kiev and along the lower Dnepr River. By 12th August 24th Panzer Corps had encircled elements of Central Front near Krichev, and the German 2nd Army already had 3 divisions across the Dnepr south of Zhlobin. On this date Keitel (OKW) issued another supplement to Directive No 34 (first issued on 30th July) detailing the objectives of Army Group Centre. It reiterated Hitler’s previous directives and essentially stated that the infantry in 4th and 9th Army would go on the defensive, 3rd Panzer Group would move north to assist Army Group North’s assault on Leningrad, and 2nd Panzer group and 2nd Army would operate in conjunction with Army Group South in its operations to conquer the Kiev region, Kharkov and the Donbass. Meanwhile the Stavka continued to believe Moscow was the primary objective, but as a precautionary measure they formed the new Briansk Front (Eremenko) south of Reserve Front on 14th August. The Briansk Front (initially allocated the newly mobilised 50th, and the 13th and 3rd Armies) was tasked with protecting Kiev from an attack from the north, and preventing any eastward advance of 2nd Panzer Group and 2nd Army, and so protect the southern flank of the Moscow approaches. However, by 16th August the 2nd Panzer Group was already placing the junction of Central Front and the newly forming Briansk Front under pressure with 24th Panzer Corps, while 47th Panzer Corps was moving southwards in support. By 17th August 24th Panzer Corps had captured Unecha, and on this date Brauchitsch and Halder tried one last appeal to resume the advance towards Moscow (in the centre). Their arguments (to no avail) were set forth in a memorandum detailing why the advantage gained by the Wehrmacht on the road to Moscow should not be squandered. By now however the 3rd Panzer Group’s 39th Panzer Corps was already moving northwards to join Army Group North near Leningrad (see Northern Sector). Also 3rd Panzer Group’s 57th Panzer Corps was preparing to move north-eastwards to attack and retake Velikiye Luki in conjunction with 9th Army. By 19th August elements of the German 2nd Army were fighting their way into Gomel, 24th Panzer Corps was advancing on Starodub (into the rear of 21st Army), and 47th Panzer Corps was on the eastern flank of the advance. The latter came under Soviet counter-attack but continued to push back the 13th Army in fierce fighting around Pochep and Unecha. The Germans had effectively created a breach between Central and Southwestern Fronts, as well as severing 21st Army from Central Front. By 24th August, 24th Panzer Corps had captured Novo Sybkov and Central Front was in real danger of collapse: it had already lost over 80 000 POWs (the equivalent of 6 full strength pre-war rifle divisions) in recent fighting with the 2nd Panzer Group. On 25th August the 2nd Panzer Group’s 47th Panzer Corps (in the south) captured Trubchevsk near the Desna River, and Starodub also fell. The Central Front was now severely depleted, its 21st Army was threatened with encirclement, and the 2nd Panzer Group was deep into the northern flank of Southwestern Front. Briansk Front’s main strength (including the new reinforcing 50th army) was still eastwards of the German’s southerly thrust: its focus was still on a possible easterly thrust by 2nd Panzer Group. 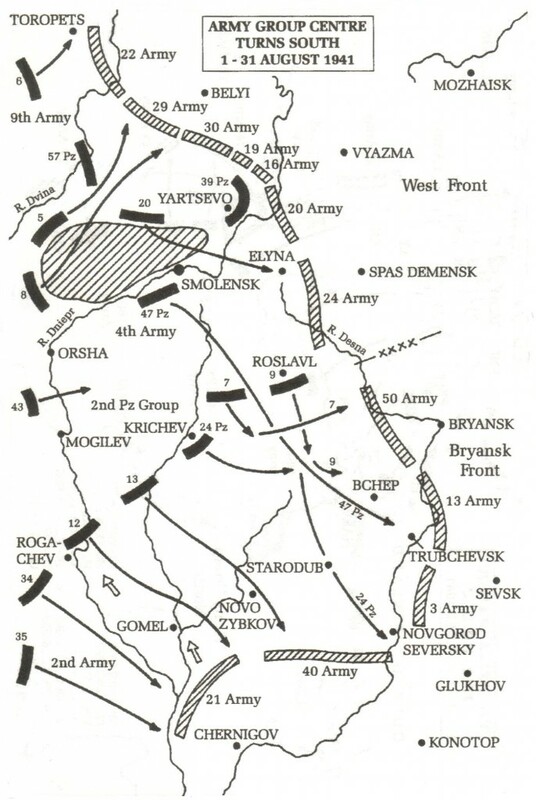 Briansk Front was in a position to (and ordered to) counter-attack 2nd Panzer Group’s flank, but was not in a position to block any southerly thrust by 2nd Panzer Group should the counter-attacks fail (which is what actually occurred, refer The Roslavl-Novozybkov Offensive Operation below). It would have been more prudent to reinforce the disbanding Central Front’s 21st Army, and allocate it directly to Southwestern Front with orders to protect its northern flank. The bulk of the newly mobilised armies were still being sent to Western and Reserve Fronts. The latter were now ordered (in mid August) to counter-attack German forces along the line Smolensk-Elnya. This led to a series of offensives against the infantry forces of Army Group Centre (in the centre) which were holding the line during late August and September 1941. (Refer to The Dukhovshchina Offensive Operation and The Elyna Offensive Operation below). The only real concession to Southwestern Front’s increasingly dangerous position was to deploy the newly mobilised 40th Army (formed on 28th August) on the northern wing of Southwestern Front, east of 21st Army. However this army had to draw forces from other front sectors and initially only had 2 rifle divisions, 1 (depleted) tank division, and a small paratroop corps attached: far too little to stop the 2nd Panzer Group’s southerly push. On 26th August the 2nd Panzer Group’s 24th Panzer Corps stormed across the Desna River at Novgorod-Seversky and started to secure a bridgehead. Meanwhile the 47th Panzer Corps (with infantry divisions in support) continued on the eastward flank of the advance (against persistent Soviet counter-attacks from Briansk Front). By now however the 2nd Panzer Group’s 46th Panzer Corps was starting to move up behind 47th Panzer Corps, so any possible Soviet breakthrough on the advance’s flank was likely to be short lived. The Soviets (principally 40th Army) counter-attacked the bridgehead at Novgorod-Seversky but by 30th August the 24th Panzer Corps was ready to resume its offensive southwards. On 29-30th August, Eremenko (Briansk Front) was ordered to conduct an all out offensive with the aim of destroying the 2nd Panzer Group grouping around Starodub and closing up the 13th and 21st Armies. In so doing the threat to Southwestern Front around Kiev would be eliminated, and Moscow’s southern axis would be protected. In order to facilitate this offensive the Briansk Front would be reinforced with the newly mobilised 43rd Army from Reserve Front. These attacks were planned along two principal axes: the 43rd and 50th Armies (deployed from north to south) would strike along the Roslavl axis, while the 3rd, 13th and 21st Armies would attempt to encircle the German forces around Starodub, Novgorod-Seversky and Trubchevsk. The front’s mobile group was to be called ‘Group Ermakov’ and would consist of a tank division, a cavalry division and a tank brigade. It would attack from 3rd Army’s sector and spearhead the advance on Novgorod-Seversky from the north-east. Meanwhile the 40th Army was tasked with holding the 24th Panzer Corps spearheads and filling the vulnerable gap between 21st and 13th Army. * D.M. Glantz, Forgotten Battles of the German-Soviet War, Vol I, The Summer-Fall Campaign (22 June-4 December 1941), white paper David. M. Glantz 1999, p. 103. Despite the Briansk Front’s best efforts, Guderian’s panzers continued their advance relentlessly; brushing aside Eremenko’s attacking force. By 1st September the 24th Panzer Corps had secured and extended its bridgehead around Novgorod-Seversky and was pushing southwards; capturing Krolovetz on 3rd September. On 24th Panzer Corps’ west flank the 2nd German Army attacked towards Chernigov, pushing back the 21st Army which was to all intents and purposes now isolated from Briansk Front. By 6th September the depleted 21st Army and 40th Armies had belatedly been placed under Southwestern Front’s control, but by now 2nd Panzer Group and 2nd Army were rolling up the whole northern flank of Southwestern Front. On 8th September Chernigov was captured by 2nd Army, and by 10th September 24th Panzer Corps had crossed the Seim River and had captured Konotop and Romny (pushing back the 40th Army). At the same time the 46th and 47th Panzer Corps also pushed south-eastwards and captured Putivl and Glukhov. By 12th September Southwestern Front’s dire situation must have been apparent to all, especially when viewed with Army Group South’s breakthroughs further south. However Stalin continued to refuse to sanction a withdrawal of Southwestern Front (giving up Kiev), although Marshall Budenny (commander southern theatre) and Kirponos (commander Southwestern Front) had both requested permission to withdraw. Instead, Budenny was dismissed (largely for making such an intelligent but apparently defeatist suggestion), to be replaced by Timoshenko who had been commander western theatre. In all likelihood however, even if the Stavka had sanctioned a withdrawal on 10-11th September it would already have been too late to save the vast majority of forces in Southwestern Front. (Refer Breaching the Dnepr River Line for more on why this was the case). By 13th September lead elements of the 3rd Panzer Division (Army Group Centre’s 2nd Panzer Group/24th Panzer Corps) reached Lubny from the north, while elements of 16th Panzer Division (Army Group South’s 1st Panzer Group/48th Panzer Corps) reached the outskirts of the town from the south. On 14th September the 3rd and 16th Panzer Divisions linked up near Lokhvitsa. Southwestern Front was now effectively isolated in what became known as the Kiev Pocket. From mid September until the beginning of Operation Typhoon (the offensive towards Moscow), the 2nd Panzer Group was essentially working for Army Group South in containing and assisting in the liquidation of, the Kiev Pocket, and preventing any Soviet counter-attacks relieving the pocket. (Refer Southern Sector, The Kiev Pocket for details on the containment and liquidation of the Kiev Pocket in the second half of September 1941). From mid to late August the Stavka issued directives to Western and Reserve Fronts to conduct major offensives towards Dukhovshchina and against the Elnya salient. The cumulative effects of these attacks was to apparently force Army Group Centre to keep its mobile forces (3rd and especially 2nd Panzer Groups) pinned down and prevent them conducting dangerous operations further north and south. However the scale of these attacks, their persistence in the face of horrendous casualties, and released archival command documents (command directives), indicate that these offensives were deliberate attempts to forestall any German offensive eastwards and severely damage Army Group Centre in the process. 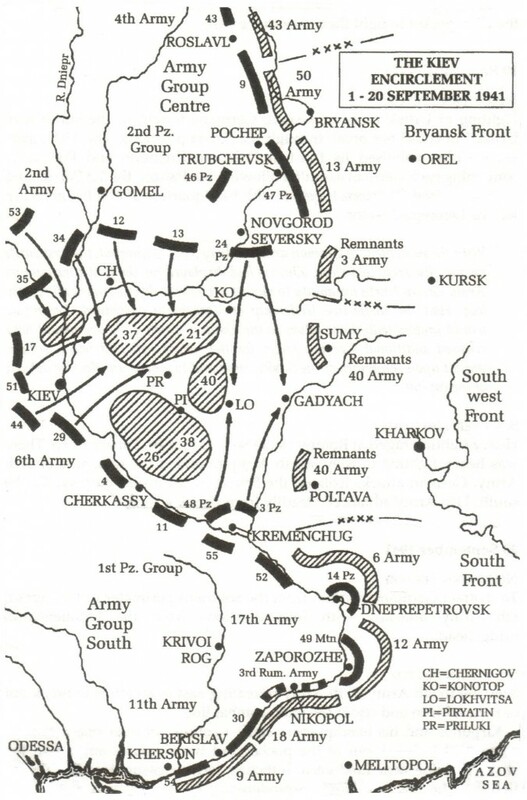 The Dukhovshchina Offensive Operation involved the Western Front’s 30th, 19th, 16th and 20th Armies (deployed from north to south) attacking towards Dukhovshchina, north of Smolensk. The 22nd and 29th Armies (further north) were to support the main offensive by attacking towards Belyi and Velizh. Western Front’s aim was to ultimately sever German communication lines with Smolensk and recapture the city. The first stage of the Dukhovshchina Offensive Operation commenced on 17th August and initially 19th Army made good progress: forcing the Vop River and penetrating 10kms into the German infantry defences. Note, 3rd Panzer Group’s 39th Panzer Corps was already moving northwards to join Army Group North at this time. Nevertheless stiffening resistance by 9th Army’s infantry divisions stalled any further advance. In the meantime 3rd Panzer Group’s 57th Panzer Corps (19th and 20th Panzer Divisions) supported by two infantry divisions prepared to launch a counter-attack against the Soviet 22nd and 29th Armies and retake Velikiye Luki. This attack was unleashed on 22nd August and rapidly sliced through the Soviet defences, outflanking the forces in Velikiye Luki. By 25th August the Germans had isolated large elements of the 22nd Army in Velikiye Luki. By 29th August the 57th Panzer Corps and supporting infantry corps had forced the remaining elements of the 22nd and 29th Army back over the Western Dvina River. Despite a series of counter-attacks, most notably by the newly mobilised and adjacent 30th Army, the 22nd Army forces left in Velikiye Luki were not relieved and were eliminated by early September. Despite the setbacks further north, the 19th, 16th and 20th Army re-launched their attacks along the Dukhovshchina-Iartsevo line on 28-29th August. These extremely bloody attacks continued for nine days and one has to wonder why, given the overall situation and obvious failure to make any significant progress against dug in German infantry. On 8th September, Marshal Shaposhnikov finally ordered Western Front to go over to the defence. By any standards the Dukhovshchina Offensive Operation was a very costly military failure, and only served to weaken Western Front and help facilitate its collapse in October 1941 during Operation Typhoon. The second major offensive conducted against Army Group Centre’s holding infantry in August-September was by the Reserve Front against the German forces in the Elnya salient. This small salient represented a German bridgehead across the Desna River, although by mid August events elsewhere had rendered this position only one of many potential ‘jumping off points’ for any offensive against Moscow as demonstrated in October 1941. Thus the ‘Elnya bulge’ was largely symbolic to both sides: the Germans wanted to hold it while the Soviets were determined to ‘flatten’ it. The task of retaking Elnya fell to the Reserve Front’s reinforced 24th Army (Rakutin). The first assaults began on 17th August against the five German infantry divisions defending the exposed salient on the east bank of the Desna River. However these attacks achieved only limited gains at high cost and were called to a halt on 21st August. The 24th Army was then seriously reinforced with replacements and new divisions. By 23rd August the 24th Army contained 10 divisions, including 2 tank and 1 motorised division (effectively an armoured corps), as well as no fewer than 21 corps and RVGK artillery units. This massive artillery force was going to pound an exposed salient only 20km wide at the neck and 32km deep! The new offensive was scheduled to commence on 30th August, planned to coordinate with the much larger Western and Briansk Front’s offensives further north and south. Unsurprisingly the 24th Army succeeded in penetrating the salient defences, but only after extremely heavy fighting. By 4th September the northern and southern shock groups had penetrated and deeply enveloped the German 20th Corps (defending the salient), threatening the defenders with encirclement. Unable to reinforce the defenders, especially with any armoured forces as they were all committed elsewhere, Army Group Centre ordered the infantry divisions in the salient to conduct a fighting withdrawal. On 6th September Elyna was recaptured, and by 8th September the 24th Army had cleared the salient and closed up to the German’s prepared defences on the Ustrom and Striana Rivers (on the neck of the salient). Some post-war literature, particularly Soviet era, has hailed the Elyna Offensive Operation as a clear Soviet victory. One author has even gone as far as to claim that it demonstrated Zhukov’s skill in the use of combined arms because the Soviets used infantry, tanks and artillery in the battle! However, a more objective perspective shows that in fact the relatively minor Elyna Offensive Operation demonstrated many of the weaknesses in the Red Army in 1941. Firstly, the Soviet casualties were excessive even by Red Army standards: of the 103 200 men committed to battle from 30th August to 8th September, 31 853 (almost a third) became casualties. Not for the first time, a Stavka directive of 13th September rebuked Zhukov for crudely organising an offensive and suffering excessive casualties. Secondly, it took a force with a 2-3 to 1 superiority in infantry, and a much higher superiority in tanks and artillery, 8 days of fierce fighting to clear an exposed salient only 20km wide at the neck and 32km deep. The 24th Army was probably the strongest army in the Red Army in early September 1941, and yet it was used to clear a minor salient while elsewhere entire Soviet fronts were under threat of encirclement and destruction. Even worse, when Operation Typhoon commenced in early October 1941, the 24th Army was already severely weakened. This very likely contributed to its destruction in the Briansk pocket later that month.